Dine with us each Monday from April 1, 2019 to February 28, 2020 to enjoy a Meat Free meal and get a chance to enter to win monthly prizes, including the grand prize... a trip to Thailand! 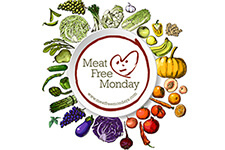 Ask your server for a Meat Free Monday drawing entry coin with your check at the end of your meal. Drop entry coin in the glass jar by the front door of the restaurant. Hope to win amazing prizes and come back as many Mondays as you'd like for additional entries!